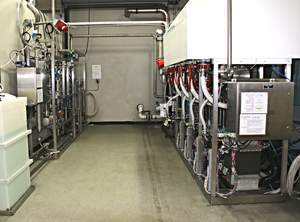 Proton OnSite, the world leader in Proton Exchange Membrane (PEM) water electrolyzer technology, announced today that its Megawatt (MW), M Series PEM Hydrogen Generation System achieved over 500,000 cell operating hours with no failures or loss in efficiency. This highlights Proton OnSite's 20 years of high-impact innovation and over 1 billion fielded cell hours of PEM technology. The M400, introduced in January 2015, provides a 13x increase in hydrogen production compared to other commercial PEM systems. In combination with greater production capacity, the M Series reduces the per kW capital cost of producing hydrogen by over 50%. The growth of the renewable energy industry has created a need for large-scale energy storage solutions. The M Series addresses this demand by providing scalable cost-effective conversion of excess, stranded or curtailed power to hydrogen, offering a carbon-free solution to capture and store large volumes of energy. "Achieving over 500,000 M Series cell hours with zero failures or efficiency loss; exceeding 2500 installations in more than 75 countries, and celebrating our 20th anniversary producing dynamic solutions to meet consumer demands, add to the many advantages that clearly differentiate Proton from its competitors," said Robert Friedland, President and CEO of Proton OnSite. "As I've highlighted before, it is important to understand that a functioning PEM electrolyzer is not overly complicated to build. The real challenge comes in making systems rugged, safe and reliable for real industry applications. Proton is the only PEM electrolyzer company that has the installed base, experience and time in the market. Leveraging this experience for our new M Series was key to deliver unprecedented cell performance, putting Proton years ahead of competing technology." PEM technology has the unique ability to rapidly respond to renewable energy input making it the preferred method for electrolysis. In addition, annual maintenance costs are significantly less than more traditional alkaline electrolysis technologies. The M Series offers a highly cost-effective approach for Power-to-Gas applications and an economical alternative, compared to delivered hydrogen, in many large industrial markets. "Building upon the exceptional quality, performance and longevity that we have come to expect in our existing product lines, our M Series unit achieved a recent milestone of over 500,000 cell operating hours, and continues to push the boundaries of innovation and high-impact technology acceleration throughout the market. This significant accomplishment further validates Proton's superiority in electrolysis," stated David Bow, Senior Vice President, Sales, Service and Marketing of Proton OnSite. "We are confident that the M Series' fast response time, durability and cost-efficiency will substantiate its ability to satisfy a greater percentage of Energy Storage, Power-to-Gas and Vehicle Fueling projects and will exhibit the needed financial return to move forward." Proton Energy Systems, Inc. d/b/a/ Proton OnSite is a global leader in hydrogen gas solutions. Since 1996, the Company has been developing and applying hydrogen technology in creative and practical ways that best meet the diverse requirements of its customers. Proton OnSite sells commercial hydrogen, nitrogen and purified air equipment across a broad range of markets including electric generator cooling, analytical laboratories, semiconductor fabrication and material processing. Proton OnSite is also a trusted partner to the military, aerospace, fueling and renewable energy industries. The advanced proton exchange membrane (PEM) electrolysis systems coupled with the Company's uncompromising attention to excellence and quality enables Proton OnSite to deliver, install and support gas generation units on every continent. Proton OnSite has also expanded its services to include packaged solutions incorporating tanks, compressors and other ancillary equipment. These products and services now allow Proton Onsite to serve a broader commercial set of markets providing turnkey as well as engineered solutions. For further information please visit: http://protononsite.com/products/m/. Proton OnSite's M Series PEM Hydrogen Generation System.